Haier 18-Bottle Dual Zone Curved Door Wine Cellar (March 2018) Review! 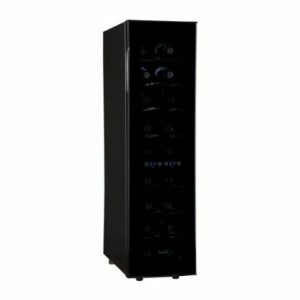 We’ve already reviewed Haier 6-Bottle Wine Cellar on our list, this is a higher version to the same model. It is dual zone cooling compared to the 6-Bottle wine cooler which was just single zone cooling. You can store your Red wine and White wine in this one. If you go with single zone cooling then you can’t do that. This one also uses Thermal electric cooling and thus doesn’t make loud noise. And it’s also vibration-free due to the same fact. The overall design is like a tower and it doesn’t take up much space due to it’s slim design. The major difference is it has 9 full-width shelves, which are adjustable and removable if you wish. It’s divided into two compartments, and you can set different temperature for both of them. On the top compartment it can go between 46F to 66F, this is ideal for storing your sweet wine as they require cold temperature. The lower compartment is ideal for your dry white wines – it has a limit from 54F to 66F. The look and the design is similar to Haier’s 6-Bottle wine cellar, it comes with curved door and on the glass has smoked effect. The overall color is Black Trim/Black cabinet, which looks cool. The controls are touch screen as well. This is perfect for wine lovers who require dual zone cooling. The customer reviews are highly positive on this one, you can read the detailed customer reviews from Amazon.com here. If you prefer single zone cooling then you can check our reviews of Sunpentown WC-20TL Wine Cooler and NewAir AW-181E 18 Bottle Thermoelectric. You can also head back to our list of 10 best wine coolers in 2019.